LIC of India launched a new Non-Linked with profit Plan i.e Navjeevan Plan No.853 on 18th March 2019. Let us discuss it’s features and review. If you see the history, LIC always launches new policies every year in January to march. Here, The reason is simple Employees or Tax Payers usually plan their tax-saving investments from January to March months. So, in order to attract these tax payers LIC of India launches new plans every year in Jan to March months. As I said above, this Navjeevan Plan No.853 is non-linked with profit policy. The premium can be paid either as a single premium ( as a lump sum) or for a limited period i.e for 5 years. Navjeevan Plan No.853 of Lic. you can buy this plan both online and offline. If you buy this policy online you will get a discount of 2% in case of single premium and in case limited period payment of premium 5% discount for a period of 5 years. You can get the paid-up benefit if the premiums are paid for 2 years. You can surrender your policy at any point if the premium paid is single. But in case of a limited premium option, you can surrender the policy after two years completion of the policy term. You can get a loan from this policy. In the case of Single premium, you can get a loan after 3 months and the max loan amount is 80% of the surrender value. In case of limited premium payment option, the loan can be taken after 2 years. The max loan can be taken is 80% of surrender value ( for in force policies) and 70% in case of paid up policies. * If your age is less than 8 years, then the commencement of risk (insurance coverage) will be started either one day before the completion of 2 years from the date of commencement of policy or one day before the policy anniversary coinciding immediately following the completion of 8 years of age whichever is earlier. 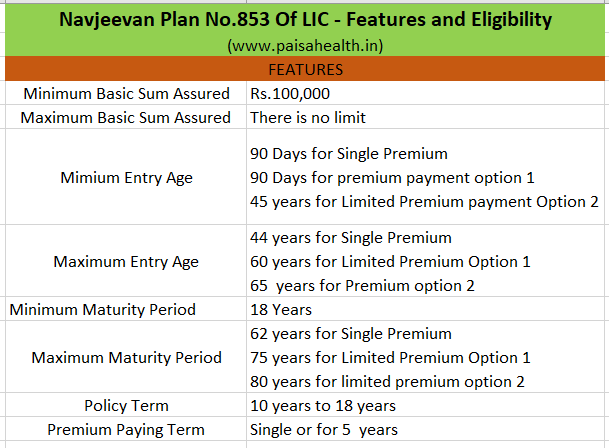 What are Option 1 and Option 2 in Navjeevan Plan No.853 of LIC? This option 1 and Option 2 are applicable only when if you pay premium as limited payment not when you have paid premium as a Lump sum. When the premium is paid as single premium then the death benefit 10 times of the single premium paid. If you are is less then 45 years, then you will receive 10 times of annual premium payment as a death benefit. If your age is above 45 years, then you chose one out of two options available. 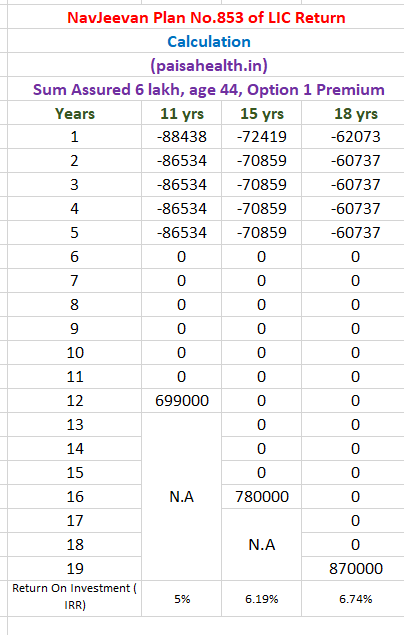 option 2) You can choose the option of 7 times of annualized premium as a death benefit. In case the policyholder of this plan survives till the policy term then he will receive Basic Sum Assured + Loyalty Addition as Maturity Benefit. If the policyholder dies before completion of first 5 years, and before the commencement of risk ( Insurance coverage), then premiums will be refunded without any interest. But in case of death of policyholder before completion of 5 year, but after commencement of risk ( insurance coverage), then the nominee will receive Sum Assured as Death Benefit. If the death of Policyholder occurs after completion of 5 policy years, and before the maturity then nominee will receive Sum Assured + Loyalty Additions as Death Benefit. Sum Assured meaning in case of Death Benefit?.. In case of Single premium highest of the below options will be paid as Death Benefit. 10 times of annual premium ( in case of option 1 is selected) and 7 times of annual premium ( in case of option 2 is selected). Imp Note:- The Loyalty Addition assumed for 11 years is Rs.150, for 15 yrs Rs.200 and for 18 yrs Rs.250, and the premium is yearly premium. The 2nd year premium will be slightly lower as GST Rate will be lower from 2nd year onwards for Life Insurance premiums. Frankly speaking, LIC Of India launched this plan to lure people in the month of March 2019 who look for policies to buy for tax saving. But you should not buy life insurance policy policy not only for tax saving. Your main priority should be while buying life insurance to have proper life insurance coverage to protect your dependents and Financial Goals in case of your sudden demise. But the life insurance provided under this plan will not be sufficient to take care of your life insurance needs. Most Planners like me suggest Need -Based Analysis to take life Insurance. If you are not eligible for the enough life insurance coverage under need-based analysis, then at least you should take life insurance policy to cover at least 10 to 15 times of your annual income. Not only this you should not mix your life insurance with Investment. Read this article why? Moreover, If you see the return expected from this policy in the above table image, the return is around 5% to 7% only. But when you are investing for such long periods, you should not be investing for such low returns. Finally, This Navjeevan Plan No.853 of LIC of India Neither good for Life Insurance Coverage nor for Investment purpose. According to my view taking term life insurance under need-based analysis is good to protect dependents from a financial loss in case of your sudden demise. In addition, investing rest of money in Financial Assets like mutual funds, Bank FD, PPF goal oriented following asset allocation and risk tolerance is Good. Read article About Ulips- Why you should not buy even they are tax fee at maturity. Click here the read it.